Here’s why cities need to get ready now. The arrival of 5G—the next generation of wireless networks—unleashes an opportunity for smart cities to take full advantage of what’s being called the Fourth Industrial Revolution, where everything that can be connected will be and the full force of transformative technologies like artificial intelligence and autonomous vehicles will permeate where we live, work and play. 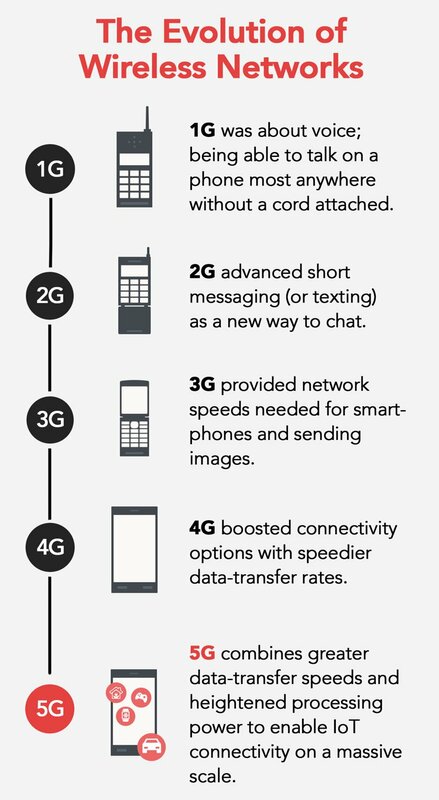 What 5G delivers that 4G and earlier networks cannot are the blazing speeds and ultra-low latencies (data transfer delays) that allow massive amounts of data to be relayed between connected devices, systems, and infrastructure in near real time. In other words, 5G enables the super-fast response and data analysis that can allow driverless cars, cloud-connected traffic control, and other sensor-laden smart city applications to truly thrive. Forward-looking city leaders are preparing now for the game-changing technology that is just starting to roll out in select U.S. markets. They realize 5G could impact most every aspect of city operations and service delivery: optimizing performance of power and water grids, trash collection, and transit; transforming public health and education; curbing pollution; and streamlining disaster management. 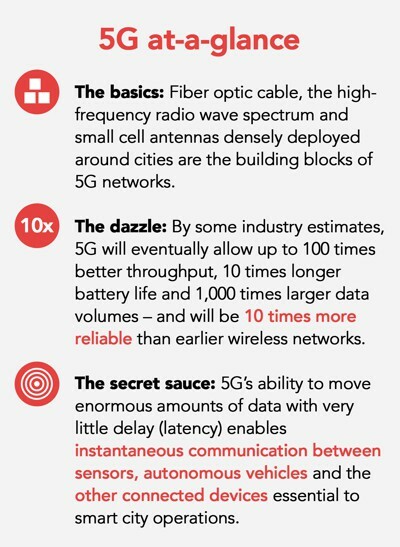 Those scenarios, of course, reflect what is known about 5G capabilities today—and we’re only on the first chapter. —Former Boston CIO Jascha Franklin-Hodge. What if trash trucks could do double-duty as pothole detectors as they cruise city streets? Or what about the opportunity for public schools to give students compelling new ways to explore the world and apply it to their lives? Franklin-Hodge, currently a Visiting Fellow at the Harvard Kennedy School, also believes 5G can trigger social benefits like digital inclusion, job creation, and economic development. He expects, for example, that 5G services will help historically under-connected communities attract new businesses. Clearly, for smart cities and their citizens, the 5G stakes are high, and the first step is to get in the game. Sacramento will be one of the first U.S. cities to demonstrate the integration of 5G networks with smart infrastructure, data analytics, and the cloud. Through a creative partnership with Verizon, a number of neighborhoods in California’s capital city went live with the company’s 5G Home service – the first in the nation – in October 2018. City officials see huge upsides in the new technology, from changing lives to changing history. So how will this forward-looking city put 5G to the test? Sean Harrington, Verizon vice president of City Solutions, expects early use cases in Sacramento will focus on safer streets, improving public safety systems, and increasing digital inclusion. There were 5,977 pedestrian fatalities from vehicle crashes in the U.S. in 2017, according to the National Highway Traffic Safety Administration. The number of fatalities involving large trucks increased 9 percent in 2017 over the previous year. With 5G, connected and autonomous vehicles will communicate in blazing fast speeds, not only with each other but also with city infrastructure—which should result in fewer collisions and fatalities. Sacramento recently signed an agreement with Phantom Auto to help pave the way for driverless vehicles. A large truck approaches an intersection just as the light turns yellow, a situation known as the “dilemma zone.” Given stopping distances, the driver has to make a snap decision whether to brake abruptly or risk running a red light. In either action, there’s potential for an accident or other traffic disruption. The simple, low-impact solution—which the sensors and 5G connectivity enable—is to signal the light controller to extend the green for just a second or two. A car moves down a busy city street when suddenly sensors detect a family on bicycles and alert the vehicle to slow down and leave extra room when passing them. In a connected infrastructure, Harrington explains, the bicyclists are detected in near real time, and with only single-digit, split-second latency, that data is sent to a connected or autonomous vehicle, providing either an alert or automated braking. In addition to traffic safety, 5G-enabled smart intersections can be useful in a variety of scenarios, from emergency response to event management. Sacramento will also test 5G’s ability to wirelessly move video from mounted cameras to a video management system. That may sound simple on the surface, but Harrington says that with today's technology it can be costly and take a significant amount of time and labor for police departments to install cameras along city streets. The flexibility that 5G offers with video – for instance, being able to quickly pull specific information out and make decisions about how much of it to store in the cloud – is not only more cost-effective, but also gives cities another tool for managing the sensitive data it collects. The real-time capability that can give police such fast access to critical video data comes from the power of 5G and the Multi-Access Edge Computing (MEC) platform, which enables rapid video processing closer in at the edge of the network, reducing data transfer delays. As cities consider how 5G networks can respond to safety concerns and other challenges their citizens face today, it’s also useful to look to future needs. For example, people are living longer than ever today, and the number of elderly residents in cities is climbing dramatically; 5G use cases in healthcare monitoring and telemedicine may be worth exploring. Or consider how many local economies rely on tourism and have an ongoing need to find creative ways to attract visitors and keep them coming back. In the 5G era of high speeds and low latency, augmented and virtual reality applications will surge and tourism could prove a natural platform for them. Franklin-Hodge, the former Boston chief information officer, believes the rollout of 5G will make the broadband market more competitive, giving the millions of people who don’t have any choice in who delivers their Internet service today more options – and most likely more affordable options. As part of its agreement with Sacramento, Verizon will also provide free Wi-Fi service in 27 city parks and is setting up STEM internship programs for area students. All are part of an effort, Mayor Steinberg said in a press release, to focus investments on equity and economic opportunity for all of his city’s neighborhoods. Using technology to bolster under-served populations is also on the minds of leaders in San Jose, California. The nation’s 10th largest city, located in the heart of Silicon Valley, had approximately 100,000 residents still lacking access to broadband internet service at home in 2017, according to city officials. San Jose is currently working with Verizon and other carriers to lay the groundwork for broadband infrastructure ahead of future 5G deployments. Though the number of cities with 5G is limited today, that won’t be the case for long. Harrington says Verizon, which is first to bring the technology to the world, is currently deploying fiber optic cables and the infrastructure for 5G in markets across the country; other carriers are working on aggressive timelines as well. Mobile 5G services and 5G-capable phones are expected to be commercially available by the first half of 2019. —Sean Harrington, Vice President, City Solutions at Verizon. That means cities hoping to deploy 5G sooner rather than later should be engaging with telecoms and following Sacramento’s lead by being open to a public-private partnership rather than a traditional vendor-supplier model. Given the significant infrastructure investment the 5G supplier would be making in a city, agreements will require long-term advantages for the city and its citizens, but also for the supplier. Start with an understanding of all of the parts of city government and all the pieces of infrastructure that 5G can touch and make sure all of those departments are part of the conversation. Be prepared to move quickly with regard to permitting processes and public right-of-way access, and proactively align city policies and rules that 5G could impact. Build a strong relationship with industry partners and make sure all parties are committed to keeping the public informed throughout the deployment process, addressing questions and concerns as they arise. Have a clear sense of your priorities; choose 5G initiatives you think will make life better for the people you serve. Franklin-Hodge suggests the evolution of technology in our daily lives will continue to progress with 5G, promising high-quality digital experiences wherever you are and on whatever device. “It’s the interesting opportunity in smart cities right now,” he says. “There’s no question that we’ll see use cases galore that are going to benefit from 5G,” Harrington added, noting that Verizon already has labs working to feed the evolving 5G ecosystem. But just as the First Industrial Revolution saw a rural to urban migration that dramatically transformed cities and economies forever, many anticipate the advent of a Fourth Industrial Revolution at the intersection of 5G and emerging and future technologies will be equally profound, transforming cities, industries, and the greater social good in ways we’re only starting to imagine.